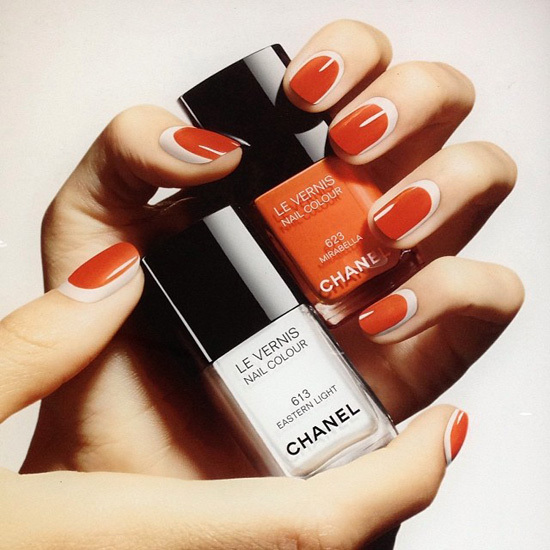 Chanel Le Vernis new collection colours will be coming up for the summer in May 2014. Here are the trends that begin to leak from the Internet to the Chanel makeup – always highly anticipated – for summer 2014. First, the collection will be called Reflets d’Été (Reflections in the summer) and it will be very, very warm and colorful . A triumph of bright colors like orange, red, fuchsia. Many gloss incoming and above all, for those who love Chanel nail polish, four tones that are sure to become smashhits. A rich collection: no less than 5 tones of enamel which will include the number 613 Eastern Light, already presented a year ago in the Hong Kong Collection, which I had put my hands on along with his brother Western Light. And do not miss the bright colors in this already interesting collection ranging from three colors in a limited edition, 615 Sweet Lilac ( lilac that attracts me very much), 619 Pink Tonic ( bright fuchsia ), 623 Mirabella ( an orange from the pictures it looks like Holiday of a very few years ago ) and a color that will go into permanent collection and that is the 621 Tutti Frutti (a light coral) . Along with these colors, of course, the usual selection of fruity lip gloss will not be missing. And, like last year, will be screened the colored mascaras , as well as a highly anticipated Chanel Stylo Eye of the golden tone. In short, wild desire for summer coming!